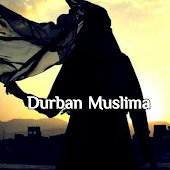 Durban Muslima: "Imagine...sitting with your spouse in Jannah. Should we go outside, sit on our thrones, with waterfalls of milk and honey flowing beneath us? And enjoy a cup of Jannah wine, while smelling the sweet scent of Jannah musk? Should we go to the souq, the market place, and meet all of our old friends that we used to kick it off with in the dunya, and talk about what dunya was like, and how we all made it here, and how Allah (swt) bestowed His favor upon us? And then your spouse says, you know what, how about we go visit the Prophet (saw) today. And so you and your spouse, go hands in hand, walking towards the house of the Prophet (saw). You pass by the homes of Talha and Zubair (ra) and you say salaam to them. And then you go and knock on the door of the Prophet (saw) in Jannah. And lo and behold, Rasulullah (saw) opens, with a big smile on his face, and says Ahlan wa Marhaban, Welcome, and embraces you. And invites you to sit inside his home, in his noble living room, and sits right across from you and asks you if would like a cup of Jannah tea. And you sit in the home of the Prophet (saw) and Rasulullah (saw) gives you a cup of tea. And he sits infront of you and gives you his undivided attention. Imagine what that discussion would be like...what would you tell him? what would you ask him? Would you tell him about your favorite moment in the seerah? Or would you ask him what Taif was really like? and how he still managed to remember us, as the blood spilled from his noble face? But in Jannah, there are no more tears and no more fears....Just the sweetness of success and sacrifices. Imagine him (saw) telling you an inside joke between him and Aisha (ra)? Or the time he (saw) caught Anas (ra) playing with kids, instead of running errands? What if Rasulullah (saw) told you how he remembered YOU, or how he knew YOUR name, and longed for the moment he would meet YOU? What if Rasulullah (saw) told you, that I remember when your Salam reached me, and I answered Walaykumusalam so and so. For the only sight more noble and beautiful than the face of Muhammad (saw), is the face of the Lord of Muhammad (saw), and the Lord of you.